The band assembles in the control room of Studio A and Beaird plays them Switzer’s piano/vocal recording of the song as he passes out charts. The musicians then take their places. Within a few minutes the instrumental track is cut with Switzer singing a “scratch” (guide) vocal. Beaird and Pahl punch in and re-record a few bars to get the track just right. A professional demo singer will lay down the vocals in the facility’s second studio, and Switzer will then go to the building’s third studio, where one of Beaird’s engineers will mix the demo. In just a couple hours, Switzer, and songwriters just like him, can have a completed demo that can be shopped to the publishers and producers of Nashville. “There’s almost nowhere you can go to record as many songs as we’re going to do in this amount of time with this quality,” Beaird says. For the second song of the day, “So Far Away,” songwriter Jim Laev of New York City is not on hand, and has entrusted Beaird to handle the recording. Beaird plays the songwriter’s original home demo for the band; its changes are more complicated than Switzer’s song was, with b9 and augmented chords. Beaird decides to change a couple of the more complicated chords in favor of simpler, perhaps more radio-friendly chords that still match up with the melody and feel of the song. Beaird himself will do the scratch vocal. Laev has never been to a demo session at Beaird’s. Instead, he sends his home demo to Beaird and trusts him and his session pros to come up with a professional demo. “I’ve had a bunch of demos done there, and have had wonderful experiences,” Laev says via telephone after the session. Laev isn’t the only one who’s had demos done demos at Beaird’s long-distance, as Beaird works with clients worldwide in this digital age. “We’ve had clients from Norway, Australia, Germany, New Zealand, you name it, who Skype in or watch the tracking session via Ustream,” Beaird says. For the day’s third song, Sweeney returns with co-writers Wesley and McQuerry. 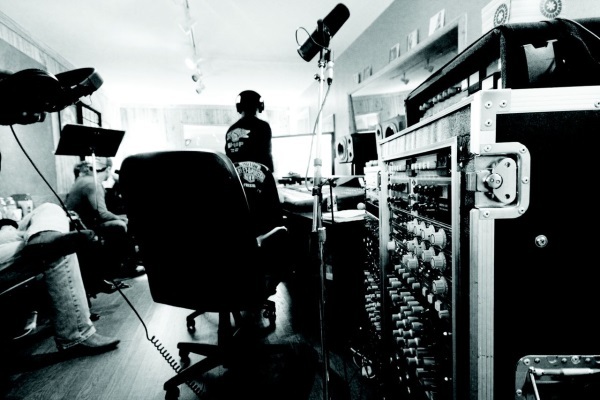 After the charts are passed out and the tracks are done with Wesley’s scratch vocal, the writers realize that they missed something and that they want to add four bars before the final chorus. So Beaird reassembles the players, and within two minutes the punch is made from the beginning of those measures to the end of the song. McNelley spends a couple extra minutes adding guitar parts, and the writers move to the next studio so Wesley can do his final vocal, leaving the musicians ready for the next writer. Barely more than 90 minutes has passed. As an added perk, Beaird offers songwriters something that’s hard to find: the opportunity to have their songs heard by major Nashville music publishers. A couple times per month, because of his reputation and industry connections, Beaird hosts “Evening With A Publisher,” where a publisher or publisher’s representative listens to the songs of writers who have recorded full-band, or “Premier,” demos at Beaird’s studio.